What is Kombucha? Everything you need to know about this fizzy tea! Home » Learn » Featured Ingredients » What’s Brewing? Kombucha! What is kombucha? Good question? Here are the kombucha basics, including what it is, how it’s made, and how you can make it at home! Yes, friends, we will be dedicating this entire week (+ more, who knows) to the fermented tea that is kombucha. It’s not necessarily an ingredient per se, but the world of kombucha brewing is vast and fizzy and delicious and not complicated once you get the hang of it. So let’s get the hang of it. I first experienced kombucha a few summers back while visiting the little sis on Maui. My general routine for two blissful weeks included stopping by one of the local hippie groceries each morning, picking up a bottle of strawberry chia seed kombucha, and setting up my hammock between two palm trees to lay and enjoy my tasty elixir. Ever since, kombucha has been my instant Hawaii flashback, which is why I can convince myself that paying $4 for a small bottle of it is okay…every time I go to the grocery. But $4 for a bottle of kombucha is not okay. For a fraction of the price (like ⅛ the price) you can brew better kombucha at home. Yes, better. So this post today will just be an overview of the vast kombucha world, and in a few days we’ll jump into the process, start to finish. Sound good? What is kombucha? Great question! Kombucha is a carbonated drink created by fermenting sugar + tea + an insy bit of starter tea + a SCOBY. 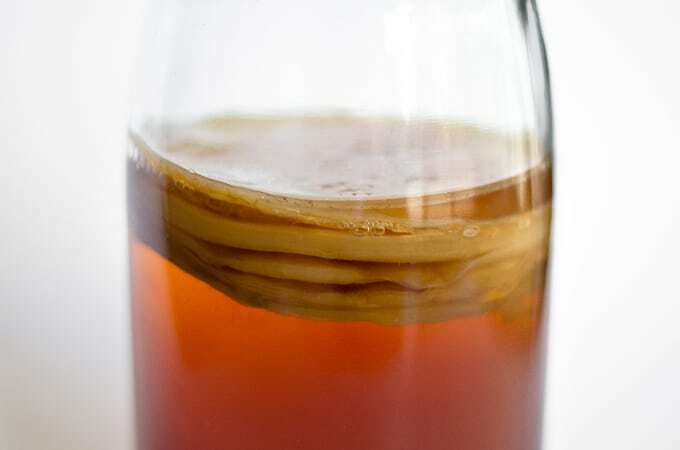 The SCOBY (symbiotic culture of bacteria and yeast), also known as the “mother”, is a thick, rubbery, pancake of sorts that rests on the surface of the brew, growing with each batch. The bacteria and yeast in the SCOBY and starter tea encourage the fermentation. And what exactly is fermentation? It’s basically just the process of bacteria and yeast eating up sugar to produce acids, gasses, or alcohol. In the case of kombucha, we’re getting a bit of each. While the most notable byproduct of the kombucha fermentation process is the fizzy effervescence from the release of gasses, the beverage also has an acidic, mildly vinegar taste, as well as trace amounts of alcohol. 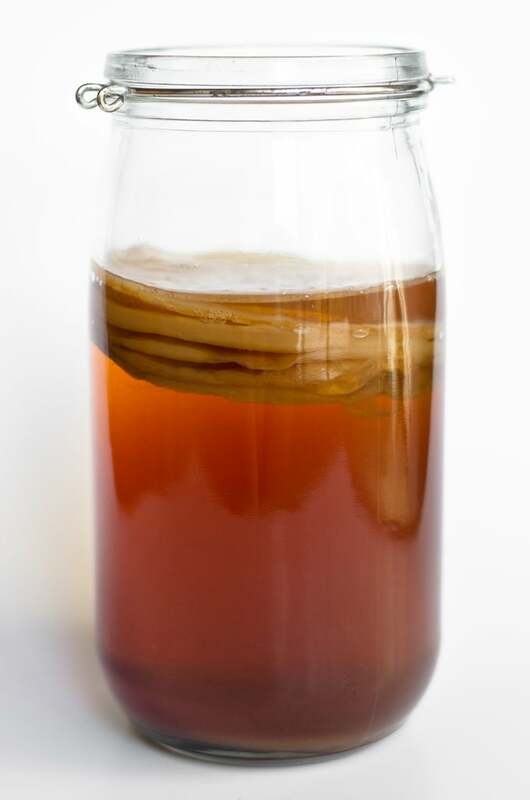 Make your SCOBY (1 to 4 weeks): sugar + tea + starter tea (like a store bought bottle of kombucha). You’ll put this all into a big glass or ceramic container, cover it with a cloth so no bugs come stealing your juice, and forget about it. First Fermentation (about 1 week): sugar + tea + starter tea + SCOBY. Again, you’ll cover it, put it in a cupboard, and let it do its thing. The longer it ferments, the more the sugars are eaten by the bacteria and yeast, the more acidic it becomes…this part is just a tasty balancing act. Second Fermentation (2 to 5 days): tea from the first fermentation + an insy bit of sugary stuff (sugar, honey, fruit, fruit juice). 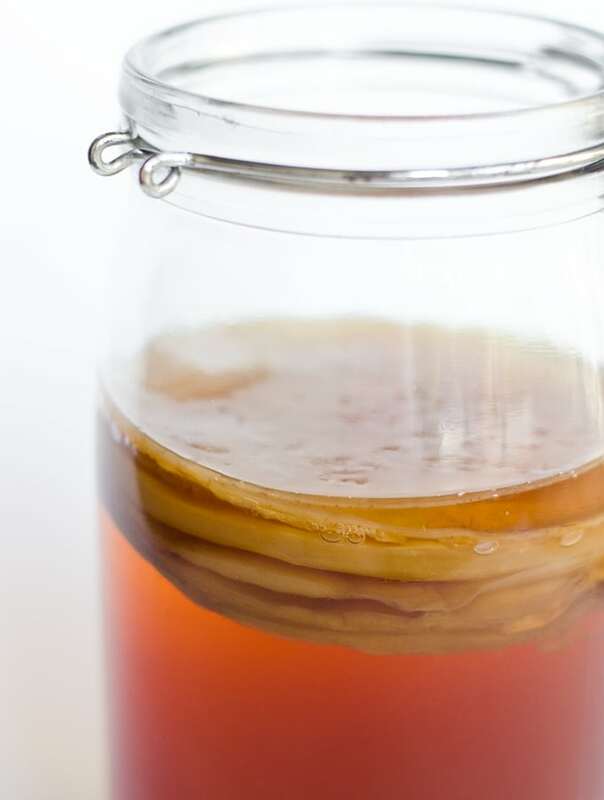 You’ll remove the SCOBY and strain out the floaties from your first fermentation, pour the fermented tea into bottles, add a touch of sweetener for the bacteria and yeast to feed on, and seal tightly with a lid. This is the anaerobic (no oxygen) step, meaning more alcohols and acids are formed. The tight seal also prevents carbon dioxide from escaping, and thus the tea becomes carbonated. Probiotics: You know all those bacteria we’ve been talking about? Yea, they’re really good for your gut. Your gastrointestinal tract contains millions (of trillions of gazillions) of bacteria that play a role in everything from your immune system to your digestion and even to your weight. Sometimes the number of these good bacteria can dwindle, either because antibiotic use or the invasion of a bad bug (hello, Moroccan giardia) or just everyday, 21st century life. Consuming foods and drinks rich in the probiotics can help to keep your microbiome balanced and strong. It’s an awesome soda substitute: The fizzy carbonation and moderate caffeination of kombucha makes it a great substitute for those looking to cut soda. The diet soda addicts can rest assured knowing that they can replace aspartame and non-caloric sweeteners (possible disrupters of the microbiome) with an equally delicious yet quadruple-y probiotic-y counterpart. And for the sugary soda lovers, how’s about some simple math. If you swap just one 8 oz soda per day with 8 oz of kombucha, that’s a difference of 110 calories…over a month that’s 1 lb! And that’s without missing out on caffeine, fizziness, or flavor. Woohoo! Liver Lover: Bottled kombucha lists 10 mg of glucuronic acid as an ingredient. Glucuronic acid is a liver compound that binds to toxic substances (drugs, alcohols, just bad things in general) so they can be excreted. While your liver does make this compound naturally, it’s possible that kombucha could give it a boost…but the jury is still out on this one. 25% Daily Value (DV) of Folate (Vitamin B9): A water-soluble vitamin that helps make DNA & RNA and metabolize amino acids. 20% DV of Vitamin B12 (Cobalamin): A water-soluble vitamin important in brain and nervous system function as well as red blood cell formation. It is only found naturally in meat and animal products, but can be made via bacterial fermentation. 20% DV of Vitamins B1, B2, B3, and B6: water-soluble vitamins that play varying roles in energy metabolism. Does kombutcha brewed with black tea retain its caffeine? My little kids would love to drink it at every meal but this question give me pause. Thanks for any input and for the great article. Great question, Kristin! Kombucha has about 1/3 of the amount of caffeine than the tea it was made with. So a black tea with 30 mg caffeine would make a kombucha with 10 mg. 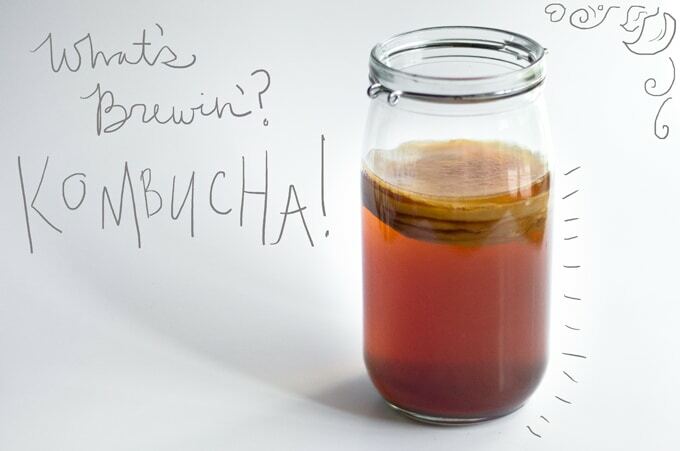 This article has a few tips on how to make less-caffeinate kombucha if you’re interested! Any brand I can get to start the mother? Should the mother scobi be peeled of layers periodically? And if so, peeled from the top or bottom? Since I have been approaching an age where one need’s to take care of his/her health, I have been looking for alternatives to food and drinks I used to take younger. Kombucha looks to be a promising alternative drink to those unhealthy ones like soda and, in a way, coffee. Thank you for this article.